The first German air flight arrived at the Sharm El-Sheikh airport Monday night, putting an end to the European country's one-year travel ban to the Red Sea resort city. The Air Germania flight had 141 passengers on board, all German tourists. German airlines were among several foreign carriers which imposed travel bans on flights to Sharm El-Sheikh after a Russian passenger jet crashed over Sinai in October 2015, killing all 224 people on board, most of whom were holidaymakers. The Egyptian affiliate of the Islamic State militant group claimed responsibility for the crash, saying it had smuggled a bomb on board. Since the crash, Egypt has been implementing new, tighter security measures at all of its airports. In May 2016, Germany started negotiations with Egyptian officials to resume direct air trips from the European country to the popular beach town. Around 170,000 German tourists visited Egypt in the first quarter of 2016 through Cairo airport, mainly visiting the popular Red Sea beach resorts of Sharm El-Sheikh and Hurghada. European travel bans have taken a toll on Egyptian tourism, a pillar of the economy and a key source of hard currency, since the plane crash in 2015. 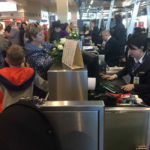 In recent weeks, a number of foreign airlines have resumed flights to Sharm El-Sheikh airport, including Turkish Airlines and Polish Airlines. Moscow and Cairo are currently negotiating the resumption of Russian flights to Egypt.